After losing her beloved husband and daughter and surviving Hitler’s Sobibor death camp, Quaker widow Anja Steinberg dedicates her life to helping others and keeping her son safe. As a member of the resistance, she helps displaced Allied airmen get back to their units in England. The journey is rigorous and filled with danger and there is no time for romance. Then American Peter Trent parachutes into her life. She must face facts—her heart did not die with her late husband and true love could be hers again. 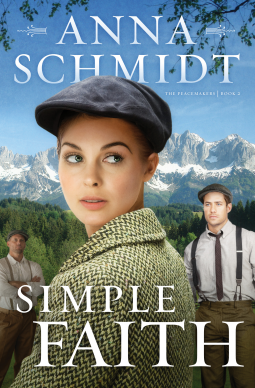 But will a romance hurt Peter’s chance of escape from the Nazis—and endanger her life as well? I did have to refresh my memory a bit, as I read book one, All God's Children, quite awhile ago. Although Simple Faith is not a true continuation of Josef and Beth's story from book one (they play a large role, but aren't the main characters any longer), and Simple Faith could be read as a standalone, I would suggest reading All God's Children first. It is helpful in knowing the characters of Josef and Beth, along with Anja and her history. Trying to get downed fliers back to their units was exciting, and I especially loved the addition of LeClerq, the master of disguises! Peter was a likeable character, and I enjoyed the 'Sound of Music' feel of the nuns and the priest at the funeral (remember when the nuns pull out the missing car parts from under their robes...haha)! I've always enjoyed characters who performed 'innocent' sabotage whenever possible! Ultimately, I enjoyed the story in this second book of Anna's 'Peacemakers' series! Thank you to Anna and Barbour Books through NetGalley for sending me a copy to read and review! 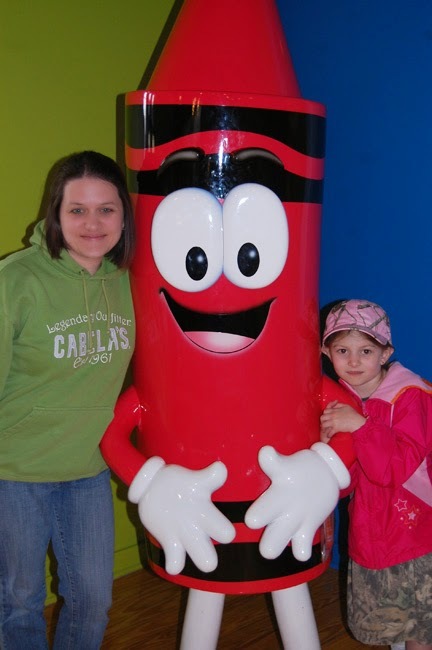 Let me preface my review by saying we went to the Crayola Experience on Good Friday (April 18, 2014). Although we'd never been, I was fully aware that a holiday day would likely make a place like this busier than normal. Whoa. It was beyond busy. It was absolute chaos. Upon arriving, we realized we would have to park in the adjacent (not free) parking garage... Around and around we drove, noticing how full the garage was at 10:15 am (only a few minutes after their 10:00 am holiday opening hours)! We parked at the very top, hoping for a picture of the building – as the art and architecture is very cool - a big box of crayons spilling out over the edge and cartoon crayons 'painting' the building. 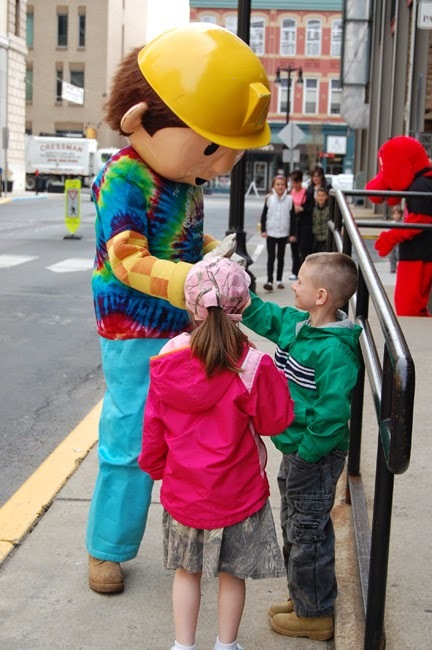 As we made our way to the entrance, we saw Clifford and Bob the Builder 'greeting' visitors. I say 'greeting,' because neither seemed even a smidge enthusiastic. It wasn't hot, so as to excuse them of being overheated in their costumes. In fact, it was a mite breezy and cool (so they should have been comfortably warm inside their apparel). Anyway, my children (ages 6 and 7) wanted their picture taken with these 2 characters that they are very familiar with. I know these 'actors' can't speak, but c'mon! Nod at the kids or something! Point at the Crayola building and clap...! Anything to pantomime excitement to the visitors! And, don't they see a mom with her camera? I never got a posed-type picture with the kids and Bob. I ended up with a picture of Bob just standing there swaying, while I also captured the back of my kids' heads, as they weren't sure what to do. Into the building we went...and were blasted by the other extreme: utter chaos! We weren't sure where to go. All we saw were people...and more people. There were no workers to greet us or give us directions. I finally found a blue-shirted Crayola person, and made my way to him. I indicated that we had tickets (I had purchased online and printed prior to our visit), and he motioned me 'that'away.' Ok... wasn't really sure where 'that' was, but I grabbed our daughter's hand and my husband took our son's (for if we didn't, we'd lose them! ), and we tried to get past the full queues at the ticket counter to where we thought we were supposed to go. Three overwhelmed-looking Crayola ladies were scanning tickets and handing out clear bags. I knew from reading previous reviews that each visitor receives a bag to put all of his Crayola creations in as he works his way through the stations. The girl began scanning my 4 tickets and handed me two bags. She slipped tokens in the bags and mumbled something about what they were for (however the noise level was so great, that I just nodded...even though I didn't quite catch it all; I assumed we'd figure it out as we went along). The girl's actions and attitudes weren't unfriendly, but she was definitely in a hurry, and I could tell we were dismissed to 'experience' the place on our own. As soon as I passed the ticket area, I turned to my husband and said, 'Where are our bags?! I thought parents got them, too? I want to create, too!!' Ok, I'll admit I felt a little whiny about it, as I'd been looking forward to making some of the fun creations along with my children (and, I paid for an admission ticket, too! )...but, I began to assume that maybe the workers saw how busy it was and were just handing bags to the kids that day. I'm sure if I'd gone back and asked for one, I would have gotten one...but, if you'd seen the crowd and heard the noise, I'm sure you would have just shrugged your shoulders, too. Again, there were no workers around to give us directions or recommendations. We just started making our way up the stairs, wondering what we were supposed to do – feeling very overwhelmed by the loud humming noise of too much humanity in one small space. I just want to say: both my husband and I are first-born children. We are independent, preferring to do and figure out things by ourselves. We don't need 'direction;' we had the Crayola map; we knew 'what' to do. But the prevailing aura of disorganization and chaos in the building had us wishing for a little direction...or something. We got to the 2nd floor and as my husband would say, there wasn't room to swing a dead cat. All of the crayon wrapping stations had lines out to 'here' (me stretching both arms out all the way) on both sides...and the noise from the adjacent room was overwhelming (there is some kind of game – looked a little like 'plinko,' and the clunking noise combined with the 'normal' crowd noise of that many adults trying to wrangle their brood and excited kids was about to drive anyone insane). Husband saw a flat screen monitor above a door that indicated the crayon factory demonstration started every half hour. Ahh, we only had about 10 minutes to wait for the next one! We decided that might be our best option so we could perhaps get our bearings and form a plan for the rest of the day. So, we got in line. People began lining up behind us. About 5 minutes later, a crayonologist appeared and told us, 'I'm sorry! The screen is wrong for the first showings. The next one doesn't actually start until --.' Which was another 40 minutes away. So much for getting our bearings and forming a plan. We huddled near a wall in the hallway, while people, people, and more people streamed past, looking at our map, trying to figure out what to start with. We thought we had a bright idea! Let's go up to the 4th floor and work our way down! Maybe other people are starting their way up, and it will be less crowded if we go backwards! Oy. We were wrong. The mass of humanity was just as thick on the 4th floor as it was on the 1st, 2nd, and 3rd floors. Really, we had no choice but to pick a line and do SOMETHING. Our poor kids! So, we got in line to do the Drip Art. The children choose 2 crayons, place them in a machine that melts and 'drips' them onto spinning paper. 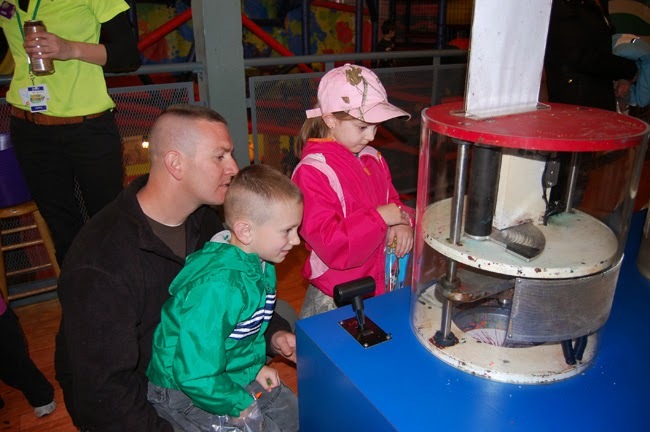 The visitor's design will vary, as he controls the spinning speed of the paper with a little lever. It was a neat project, but again, it is very hard to feel 'creative' when you are feeling rushed to finish and move on, because the line just grows longer and longer behind you. By the time we waited and finished dripping, it was just about time for the Crayon Factory demonstration to start. So, we headed back down to the 2nd floor...and got in line. I would have to say that this is the best part of the Crayola Experience. My kids were already somewhat familiar with the crayon making process (we've got Mr. Roger's classic 'crayon factory' episode on DVD), but it was still pretty neat to see the machines in action in person. 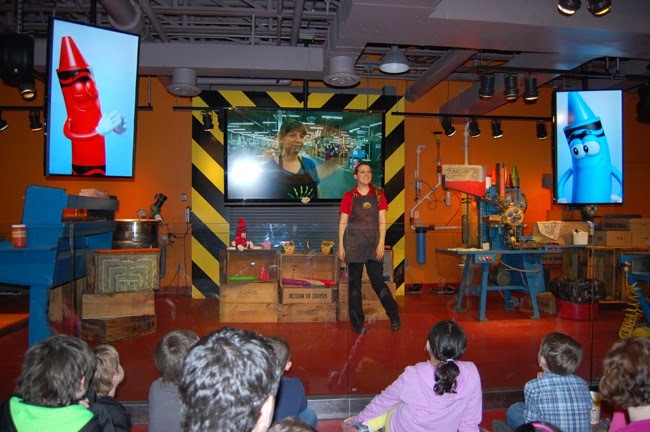 The multimedia presentation with animated crayons 'Turk' and 'Scarlet' and live Crayola Crayonologist was entertaining, and believing that you're getting a red crayon that you just saw being made was pretty thrilling for the kids (the Crayonologist hands you a !free! crayon on your way out of the show)! As we left the demonstration room, we decided to get in line at the Wrap it Up! crayon wrapping kiosks. This is when I realized what the tokens were for. Visitors only get so many tokens...and will have to use them wisely. You can't just 'load up' your bag with souvenirs...unless you've got a token to get it! To wrap a crayon, you must first insert a token. Then, on a touch screen, you get to design your own label, with an image and then you can choose your own crayon name! Once finished, the sticker label prints and a crayon drops down, like a vending machine. You remove both...and wrap the label around your crayon! Until the machine doesn't work! The father and child, two in front of my son and I never got his crayon. He just walked off, shoulders slumped. The lady in front of me looked at me with confusion... and said, 'the people on the other side didn't get one either?!' Then, she and her son began making their label...and got no crayon. So, she left her child at the kiosk and tried to find a Crayola employee. One finally came, unlocked the machine, and handed the child a crayon. Really, husband and I were ready to head to the hotel by now, but we so wanted our kids to have more memories than 1 red crayon, 1 wrapped crayon, and 1 drip art paper! The thing they really wanted to do was play on the Color Playground. We decided to visit the 3rd floor and check it out. Husband took one look...and said, 'No way!' There was no way we could allow our kids into the jungle. I just can't even describe the mass of children and adults in that one small area. It actually became more of a safety issue than anything else. Disappointment...and even a little disgust was really beginning to set in! We couldn't do anything! The tables where you could glue, cut, create, color were so full...there was no place to sit even if you wanted to make something. We finally made our way to the Marker Maker (tokens required). Again, the potential for an amazing time is here...! It was very fun to see a marker being made! But, the lines were so long that it squelches creativity! You know if you want a marker (or any thing at any station), you've got to choose a line...or never get it. It is no fun feeling rushed to choose a color, or just choose a color that you don't want because the line is shortest...wait in line...and then when it's your turn, get it over quickly, because a line of people are waiting behind you. It's hard to enjoy the process of the marker making or any of the projects in that kind of situation. I knew my daughter would LOVE the Crayon Clinic (tokens needed) – where you melt crayons into new things – shaped crayons, rings, etc. Again, when we ventured to the 4th floor to attempt it, the line was so long, we couldn't even find the end! It just wasn't worth waiting for. Same thing with the Water Works. Both kids really wanted to do that...couldn't see the end of the line. The only other station we were able to complete was the Be a Star activity. With the aid of a green screen, your face gets superimposed onto a coloring sheet with a background of your choosing (cartoon crayons in different scenes). Our kids each created one – I was sure because of the printer being used, that we would have to give up a token – but the Be a Star feature was tokenless! Again, though, we felt rushed and tried to hurry through because the line behind us was...um, dare I say: loooong?! Husband finally herded us to the gift shop and told me they could each pick out anything, and we'd get it! Normally, we avoid gift shops – as the prices are so much, and we've already spent an arm and a leg for the activity or park itself. But, since this 'experience' was so awful, husband wanted the kids to have something fun from the trip! They each picked out a plush stuffed crayon at $26.99 a pop. Ouch. Mama was cringing...tickets, parking...oy! OH! I forgot to mention the $3 the vending machine ate when son wanted a drink!! And, do you think we could find anyone nearby to let them know that we lost $3...and were still thirsty?! 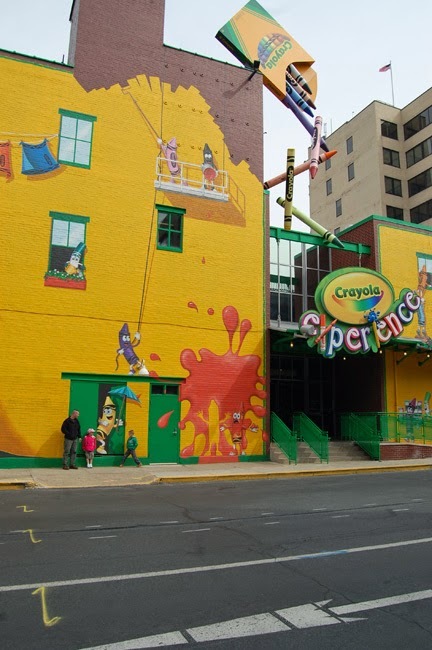 To say that the Crayola Experience was a disappointment would be an understatement. We planned our entire weekend away around a trip to the 'factory.' I'm not sure, but there needs to be some kind of organization – perhaps only so many people allowed on a floor or at an activity at once. Husband said that even the lines wouldn't bother him too much if it felt like we were making progress and moving from one area to the next. One child may spend an hour at a station, while another will not be interested and want to move on...opening space for the next in line. After reading other reviews, it seems that mismanagement of progress through the activities is a common theme. I don't know how you could pick a 'non busy' day. If you lived in the area, you might be able to call ahead. But, for us, it's a 2-1/2 hour drive. It has to be a planned thing. We'd have no idea until we got there! Despite the amazing potential for fun, I'm not willing to plunk down money for a 'maybe today'll be slow' day! As we left the building, they were holding back more people from entering. And the line wrapped around the building! I wanted to tell them all: 'Forget it!!' But, perhaps someone among them enjoys chaos and had a wonderful time. Unfortunately, we did not...and I'm sorry to say that I would caution any of my friends considering a trip to Easton in hopes of having some Crayola fun. You are likely to leave with a lot of disappointment, a headache caused by over stimulation...and an empty wallet. Did you find my review helpful? Please rate it on TripAdvisor.